Feeling rushed: Is it all in my head? Our weekday mornings are usually frenzied. The boys are both up a little after 7am. Caroline and I do our best to get them to play by themselves for a while. One of us dozes on the couch as Wally plays in the playroom while the other stays in bed and tries to fend off Jay’s inquiries, shouted at us from his room which he knows he’s not allowed to leave until the alarm goes off. Then at 8am the pace picks up: We get dressed, make breakfast, eat, clean up, make Wally’s bottles, brush teeth, find shoes, put them on. Throughout the process I’m aware of the clock, hurrying things along, trying to get everyone set for our nanny’s arrival at nine. There are several points during the day where I tend to feel rushed and stressed. One is in the morning. The second is between 4:30pm and 5pm when I’m trying to get Jay and Wally into the car so we can go pick up Caroline at school. The third is the hour before the boys’ bedtime—dinner, ‘jams, teethbrushing, books, milk, lights-out. Phew. In all three of these periods I find my heart rate’s up and the world starts to go a little dizzy. There’s this intensity of trying to move, move, move, as if the floor is going to fall away beneath my feet. Recently I read a book that made me question whether my days really need to feel this way. The book wasn’t about taking deep breaths and it wouldn’t be stocked under “self-help.” Rather, it was a sociology book about how Americans spend their time—and it made me realize that the feeling of rushing through so many parts of the day is as much about me as it is about the actual tasks that need to get accomplished. The book is called Time For Life: The Surprising Ways Americans Use Their Time. It was published in 1997 and co-authored by John Robinson, a sociologist at the University of Maryland and the director of the Americans’ Use of Time Project. The data in the book was collected using “time diaries” where research participants logged every activity they did in a single 24-hour period. 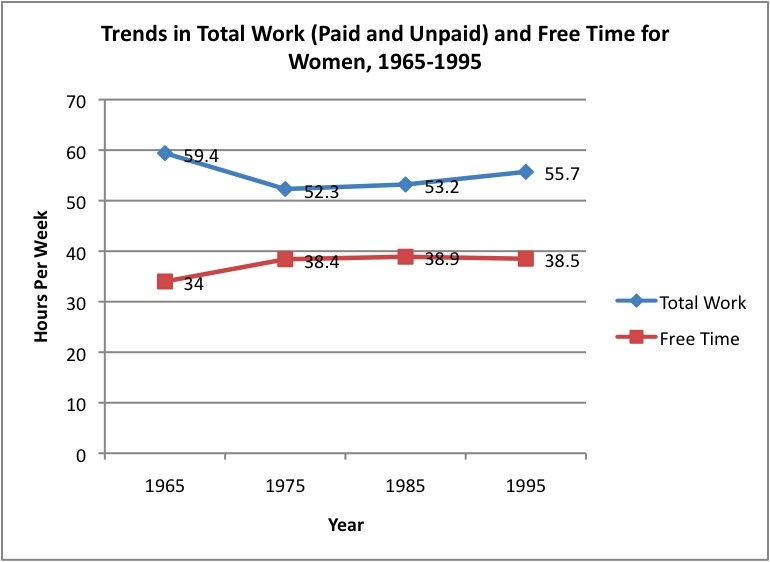 Robinson and his co-author Geoffrey Godbey use that data to analyze the time Americans spend at paid-work, doing household chores, and engaged in free time activities, and how time usage varies between men and women, racial groups, and citizens of different countries. Time For Life advances a striking argument: Americans, the authors contend, feel a lot more rushed than they should given the amount of free time they actually have in their lives. 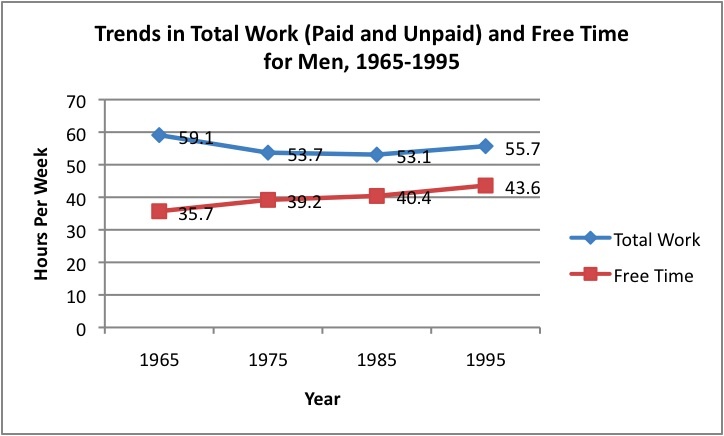 They argue that between 1965 and 1995 the amount of time Americans spent doing paid-work and household chores went down while the amount of free time we had went up. 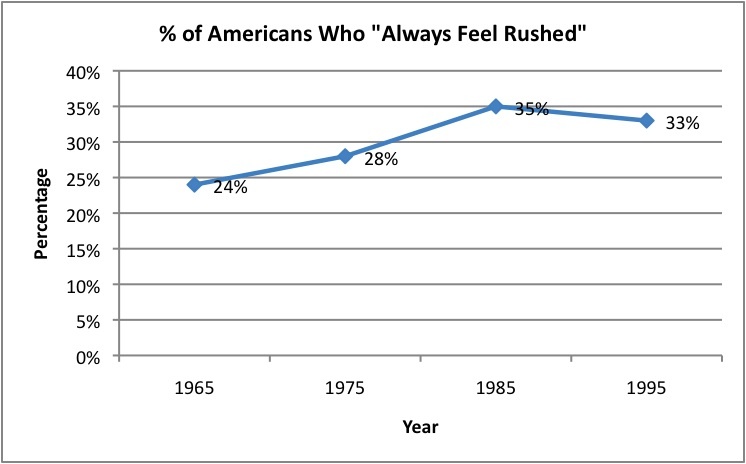 Yet over that same period more Americans reported feeling “always rushed” during their days. This data presents a riddle: Why do Americans feel increasingly rushed at the same time that we’re working less and enjoying more free time? Robinson and Godbey advance several explanations. Chief among them is the idea that, “Free time is expanding but not as fast as people’s sense of the necessary.” Put another way, we have more free time than we did in 1965 but also a greater list of things we feel like we need to accomplish in order to live good lives. When I think about why I feel rushed during my daily routine, I come up with two explanations. The first is the idea Robinson and Godbey advance—I feel like there’s a lot I need to get done in order to go to bed thinking “I’ve had a good day”: make money, advance my writing career, nurture Jay and Wally, spend meaningful time with Caroline, exercise, read for pleasure, keep up with households chores. The second explanation is that I operate with this sense that things need to get done by exactly a given time: We need to be ready to get out the door at exactly 9am; we need to pick Caroline up at exactly 5pm; the boys need to be in bed absolutely no later than 7:30pm. And when you feel like you need to keep a schedule to the minute it’s a given that you’re going to feel stressed along the way. There’s a lot more I want to write about how Americans use their time. In subsequent posts I’ll share more data about how men and women’s time-usage has changed in recent decades and I’ll write more about how our perceptions of time scarcity influence the overall levels of satisfaction we have about our lives. For now, I’ll end by saying that over the last month or so I’ve been trying hard to stop feeling that our days need to be accomplished according to such a precise schedule. This afternoon, for example, I’ll pack the boys into the car and we’ll head up Packard Avenue to get Caroline. I’m going to try remember that it doesn’t matter whether we leave the house at 4:50pm or 4:58pm. The only difference those eight minutes make is in my sanity. *I should note that there seems to be widespread agreement among researchers that leisure time has gone up over time. See, for example, “Measuring Trends in Leisure: The Allocation of Time Over Five Decades” by Mark Aguiar and Erik Hurst. This entry was posted in Uncategorized and tagged Americans Time Use Project, feeling rushed, John Robinson, more time than i think, slowing down life, Time for Life by Kevin Hartnett. Bookmark the permalink. grow older sounds right to me. I tend to measure time by the minute, too. And I’ve found that it’s a singlularly unhelpful attitude when shepherding young children. Is it more important that I be exactly on time, or that I be kind to my kids? Is it more important to show how prompt I am, how together I am, or to be kind to myself? I can do a lot to prep ahead of time so that departures go smoothly. And if I don’t, I can decide we’re just going to be late, and let the kids take the time they’re going to take. I’m so surprised that often, when I decide it’s okay to be late, things go more smoothly, and we end up leaving more quickly.